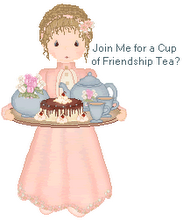 The Royal Albert Flower of the Month Series teacup for August is the Poppy. This design is from the 1970 series with the Montrose style teacup. Gladiolus is the August birth flower and the Peridot is the birthstone. this pretty teacup from the Royal Albert Friendship Series. Happy August Birthday to our youngest daughter (daughter #2), Laurel. And, happy birthday to all August birthday friends! Beautiful trio! Happy August! It's my daughter's birth month, so a special month for our family. Love the August trio set! August is my birth month and anniversary month so its special iin our family also! My eldest daughter and my older brother were born on the same day, August 9th. Nice summertime b-days to be sure! 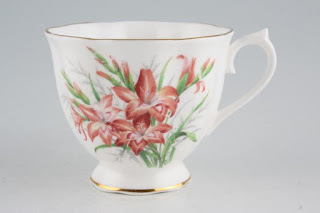 I don't believe I've seen poppies (or gladiolus) on teawares, so thanks for teaching me something new ... again!